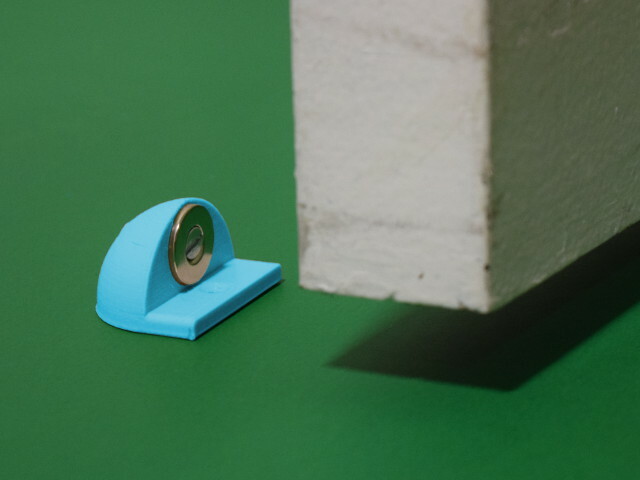 Let’s take a look at a fun use for magnets with countersunk holes – doorstops! It’s a small example of what these magnets are used for, but hopefully taking a closer look will help illuminate the strengths and limitations of countersunk magnets. A K&J prototype doorstop using a countersunk RC22CS-N ring magnet! The design we’re going with is some sort of mechanical stop that holds a door open. The door swings open, touches a magnet, and stays open until you tug it off the magnet. No flips or switches required. How strong is too strong? Here’s a handy reference: The average refrigerator door takes about 5-10 lb of force to open. We figure that any doorstop magnet setup probably shouldn’t pull much more than this. If it’s too strong, some people may have trouble yanking the door shut. How weak is too weak? We’re sometimes asked about using a magnet to hold an outdoor gate shut. The problem is the wind. If you have a big, solid gate, the amount of force applied by a strong wind can be surprisingly powerful. If you’ve limited the magnetic catch to 10 or even 20 lb, it might not be nearly enough to keep the gate closed. If you pick a magnet strong enough to resist the wind, it might be very difficult to open by hand. For gates, a mechanical latch is usually much better at staying shut in the wind. We did some quick tests with a handful of magnets. We tried a number of magnets attached to a block of wood. What did we learn? With the painted steel door, we didn’t see quite as much pull force as the official, listed Pull Force numbers for each magnet. This is probably due to paint thickness, steel thickness, and other differences from our lab test setup. Also, the door had a spring-type closing mechanism that was actively pulling the door shut with some unknown force. If you don't have such a mechanism on your door, you'll see more force with these magnets! Magnets with an actual pull force of 7-15 lb (listed pull force 15-25 lb) seemed to feel about right. Stronger magnets might also work, but could be too strong. Weaker strengths didn’t feel strong enough. RMB-B-X8 14.5 25.0 Good strength. We didn’t break any magnets during our testing, but we worry about a plain neodymium magnet chipping or cracking under repeated impacts. These magnets are made from a hard, brittle material that’s not nearly as tough as steel. 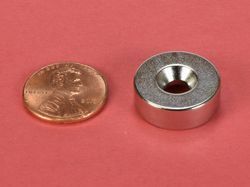 Mounting magnets with a 1” diameter provide a sturdy hold, like the MMS-A-X0, MMS-C-X0, or MMS-H-X0 magnets. We loved the rubber coated RMB-B-X8 and powerful RMB-B-Y0 magnets. If you’re using magnets outdoors, where they might get wet, use something that’s going to protect them from moisture to avoid corrosion. 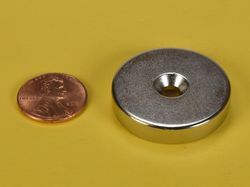 Plastic or rubber coated magnets are great, as well as the Stainless Mounting Magnets. The actual results depend on your door and your setup, but starting with magnets listed in the 10-25 lb range might be a good place to start. Don't over-torque countersunk magnets like this BC82CS-N block! While we’re on the subject of brittle magnets, keep another caution in mind. 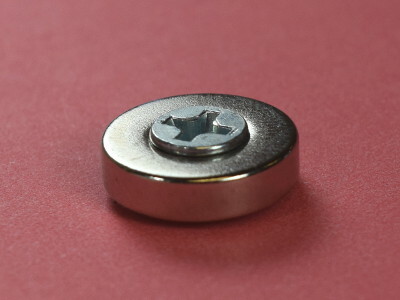 Using excessive torque when tightening the screw can cause a magnet to crack. This is more likely to be a problem with thinner magnet shapes. Thicker magnets are less fragile, but still treat them all with caution. We tried re-creating this problem to get a good photo of a cracked magnet, but were not successful. The screws we used stripped or broke before the magnet did! Even though we view this as great news, it’s something to watch out for. We weren’t able to reproduce the problem today, but we’ve heard of it happening in the field. The correct screw shown above, an incorrect, too-large screw below. 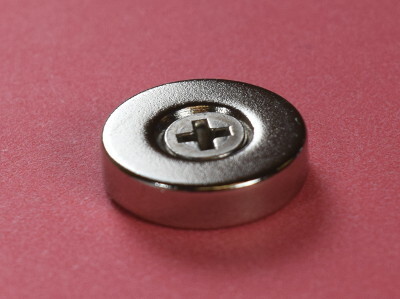 When attaching countersunk magnets, make sure to use a screw that doesn’t stand above the magnet surface. If it prevents the magnet from reaching the surface, you could see less strength. 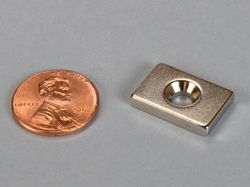 The two pictures show two different screw sizes used in an R822CS-N countersunk magnet. The correct screw sits slightly below the magnet surface, allowing the magnet to make good contact with whatever you're sticking it to. The larger screw sits above the magnet surface, preventing proper contact and decreasing the strength available. Magnetic field depiction of an R822CS-N magnet sticking to a steel disc, with either a steel or a brass screw. Are steel screws OK? Or do you need to use non-magnetic brass or stainless steel screws? We’ve explored this subject quite a lot, both analytically and with a lot of pull force measurements. While the shape of the magnetic field is definitely altered by the presence of a steel screw, it has surprisingly little impact on the pull force. Our analysis and measurements show that a ferromagnetic steel screw can increase the pull force by about 5-10%. We use whatever screw material seems appropriate for the task, and don’t worry about it too much. The difference in pull force is typically minimal, if you can detect it at all. Steel screws are sometimes a little more challenging to install, since they try sticking to the face of the magnet, rather than going down into the hole. 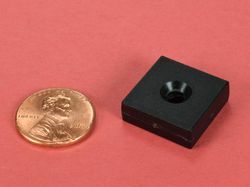 A block magnet with a single countersunk hole through the side. Unlike most of our other countersunk magnets, the poles of this block are not where the holes are! 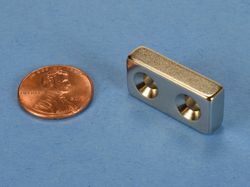 A block magnet with two countersunk holes through the side. A block with a single hole that is dual countersunk. Dual countersunk means the hole is countersunk on both sides, allowing you to mount it in either direction. A durable, plastic coated block with a dual countersunk hole. Tough and waterproof! 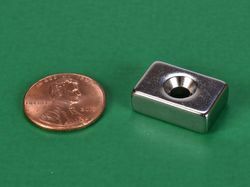 Like many of our countersunk ring magnets, this thin magnet comes countersunk on the north pole, the south pole or sold in matched pairs. 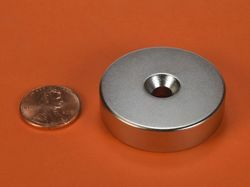 Adding to our collection of dual countersunk ring magnets, this handy size in a modest strength is incredibly useful. Our biggest countersunk ring magnet used to be 1” in diameter, but no more. This larger size offers a lot more strength. 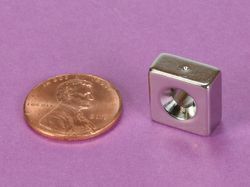 Even larger, check out this 1-1/2” magnet! Be careful with this one; it’s incredibly strong. For more choices, see our complete selection of Countersunk Magnets!